Visual Studio Code>Other>DMBinderNew to Visual Studio Code? Get it now. 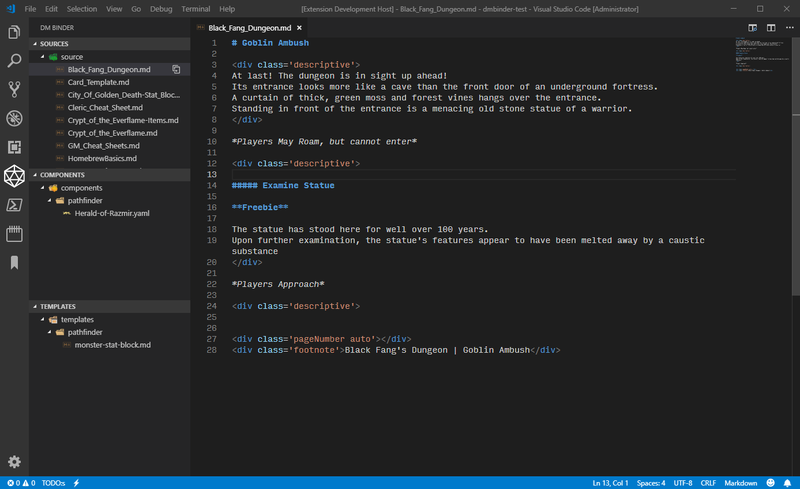 Visual Studio Code extension for managing campaign documents. The extension looks for .dmbinder/campaign.json in your workspace folders, and displays all DMBinder campaigns in the sidebar. 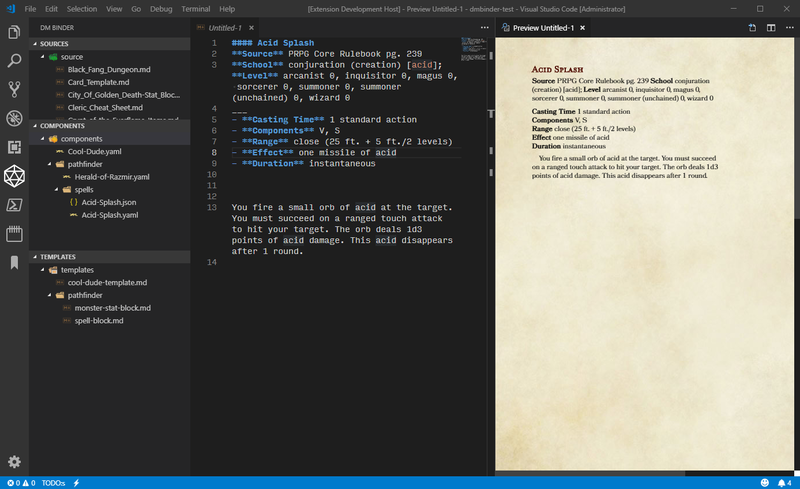 Below are pictured an example template and component for the Pathfinder spell Acid Splash. description: You fire a small orb of acid at the target. You must succeed on a ranged touch attack to hit your target. The orb deals 1d3 points of acid damage. This acid disappears after 1 round. "description": "You fire a small orb of acid at the target. You must succeed on a ranged touch attack to hit your target. The orb deals 1d3 points of acid damage. This acid disappears after 1 round." For best results when using dmbinder.config.downloadChromiumRevision to download Chromium instance for PDF rendering, it is recommended to use the suggested revision or later. Component files are fairly simple. They simply contain named data attributes that can be used and reused to insert prebuilt snippets into your markdown formatted campaign documents. "nestedAgain": "Turtles all the way down"
Despite looking somewhat messy, Pandoc's templating system was implemented over using VS Code or TextMate "snippets", due to their benefits, particularly regarding the handling of lists and conditional logic. Template files should look just like regular Markdown (.md) files, but with specially formatted placeholders that will be replaced with the data from a component. This allows, for example, all the descriptive blocks (spells, items, monsters, NPCs, magic shops, cities, etc) in your campaign documents to have a similar and consistent layout. Gone are the days where the order of monster stats changed from monster to monster! Variables are accessed based on the names defined in the component files and nested variables are accessed using the . character to denote a nested attribute. $name$ wields a *$equipment.weapon$* and is protected by their hardy *$equipment.armor$*. Cool Dude wields a *Greatsword* and is protected by their hardy *Plate Mail*. Conditions can control if content listed between the opening statement and the closing statement are output, based on checking if a variable exists. $name$ wields a *$equipment.weapon$*$if(equipment.armor)$ and is protected by their hardy *$equipment.armor$*$endif$. The part about the armor is output because equipment.armor has a value, but the next line is blank because there is no equipment.rangedWeapon defined in the component metadata. This is why template files can start to look incredibly messy using Pandoc, but the benefits can outweigh the clutter. Loops are a great way to format a list of data! $name$ is holding $for(inventory)$$inventory$$sep$, $endfor$. Cool Dude is holding a Bag of Holding, a bedroll, rations (x7), 7 gp. You can insert a component by right clicking the component in the DMBinder view, unless specified in the component data, you will then be prompted to select the template to use to format the component data. Selecting "Insert component" or using the command dmbinder.component.insert, inserts the formatted component at the cursor location of the currently opened document. Selecting "Build component" or using the command dmbinder.component.build, outputs the formatted component into a new document. Additionally, you can render all sources for a single campaign by using the dmbinder.campaign.brew command. If there is more than one campaign in the current workspace, it will list all of them and prompt you to select which campaign. See generator-dmbinder for a yeoman generator to help bootstrap a campaign binder.